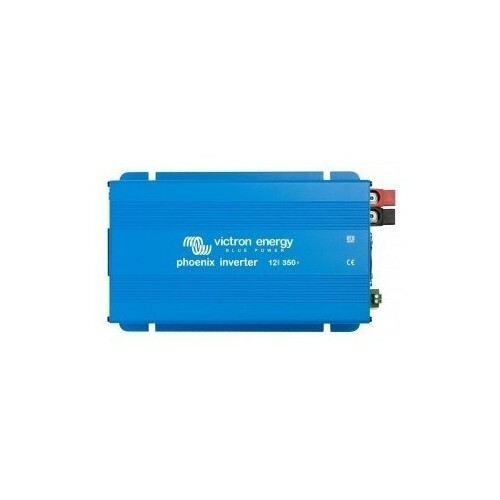 The Victron 24V Quattro 5000VA 100 Amp Charger is a powerful true sine wave inverter with a very sophisticated battery charger that features adaptive charge technology and dual high-speed AC transfer switches in a single compact enclosure. 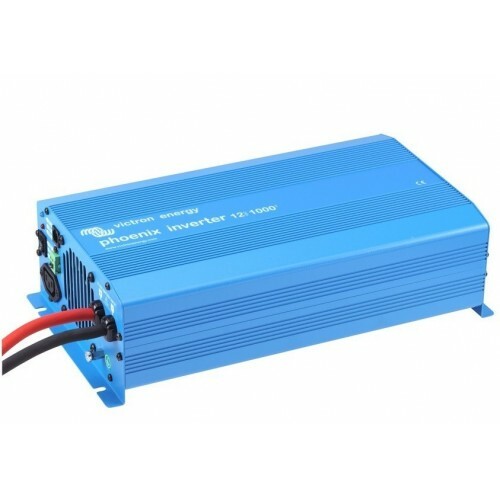 Designed to give you 4000 Watt inverter and 100 Amp battery charger and it is packed with features. 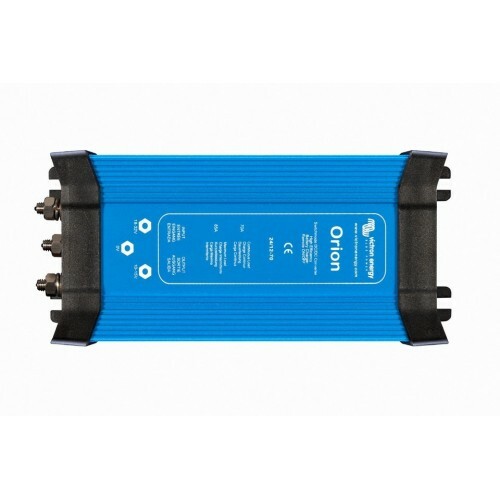 Two AC inputs with integrated transfer switch The Quattro can be connected to two independent AC sources, for example shore-side power and a generator, or two generators. The Quattro will automatically connect to the active source. 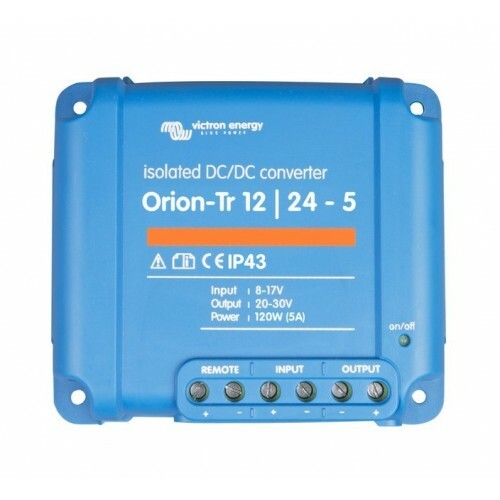 Two AC Outputs The main output has no-break functionality. 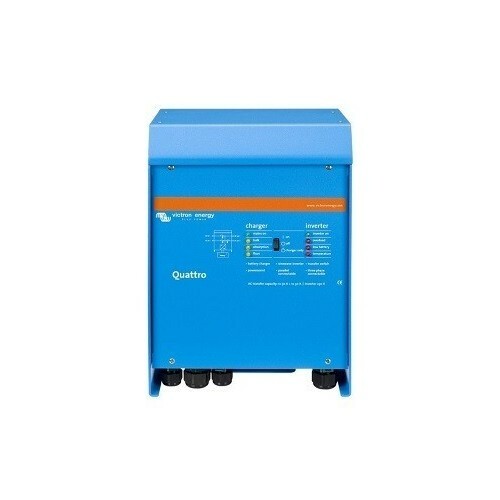 The Quattro takes over the supply to the connected loads in the event of a grid failure or when shore/generator power is disconnected. This happens so fast (less than 20 milliseconds) that computers and other electronic equipment will continue to operate without disruption. The second output is live only when AC is available on one of the inputs of the Quattro. 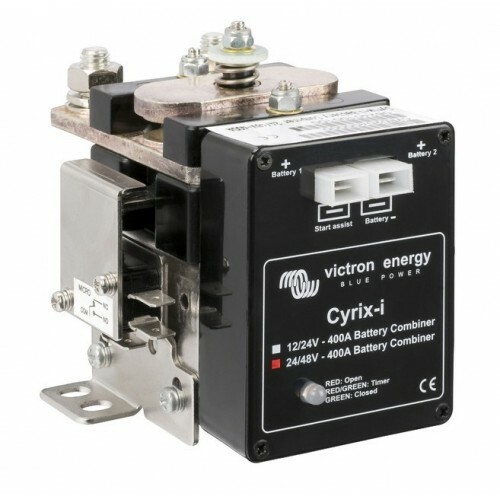 Loads that should not discharge the battery, like a water heater for example, can be connected to this output. 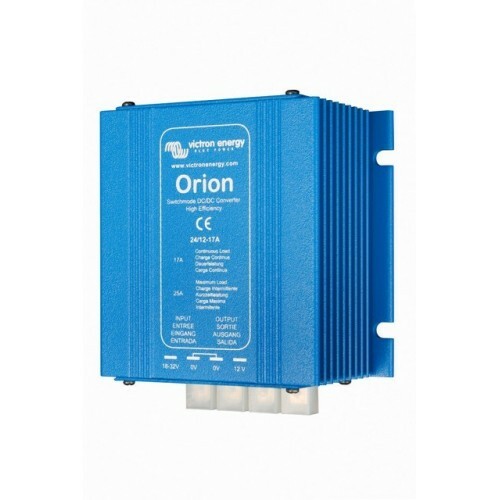 Virtually unlimited power thanks to parallel operation Up to 6 Quattro units can operate in parallel. 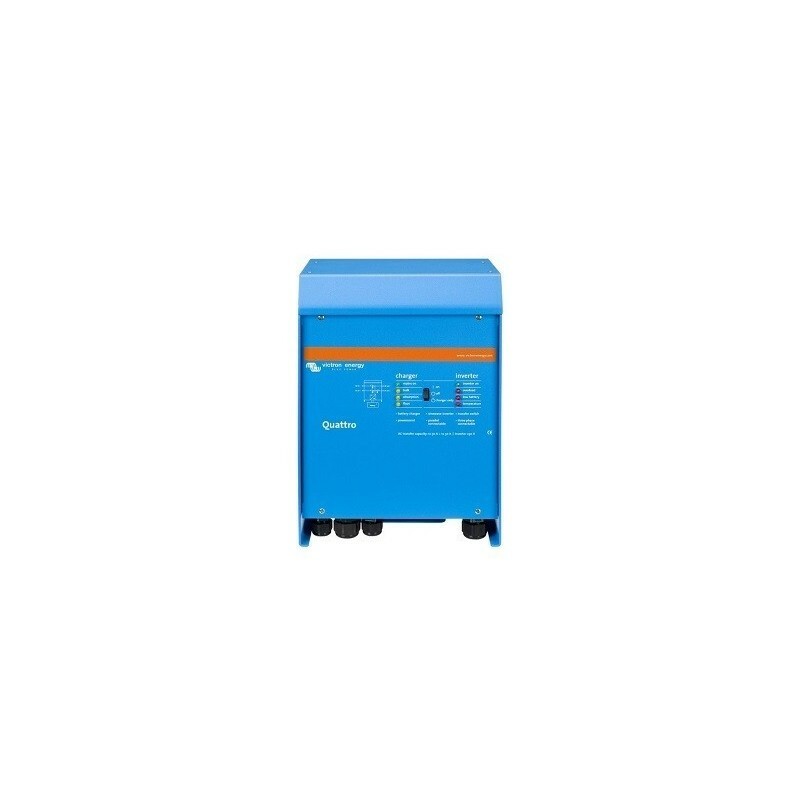 Six units 48/5000/70, for example, will provide 27 kW / 30 kVA output power and 420 Amps charging capacity. 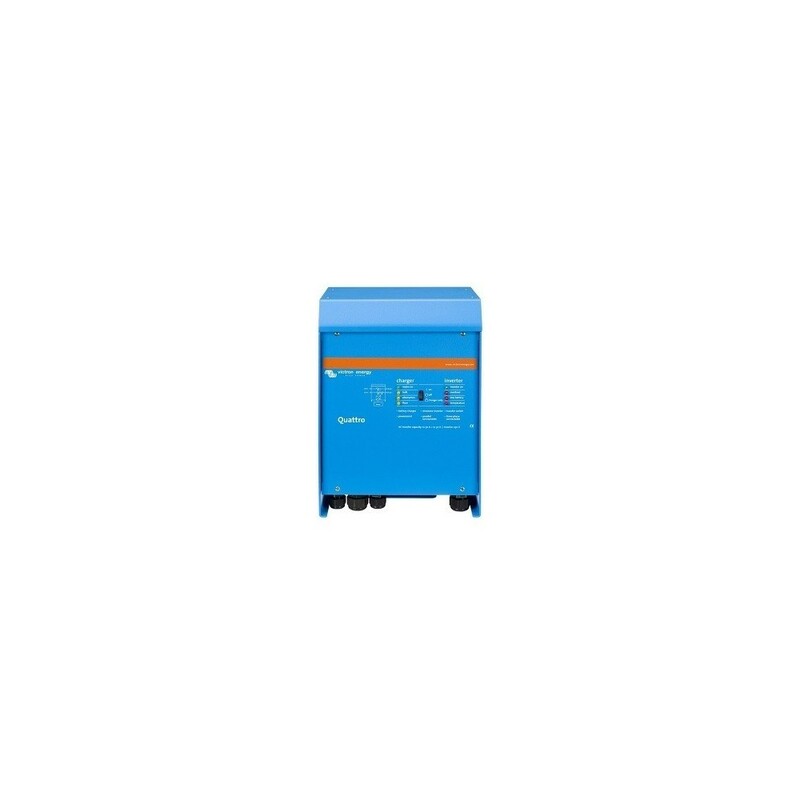 Three phase capability Three units can be configured for three-phase output. 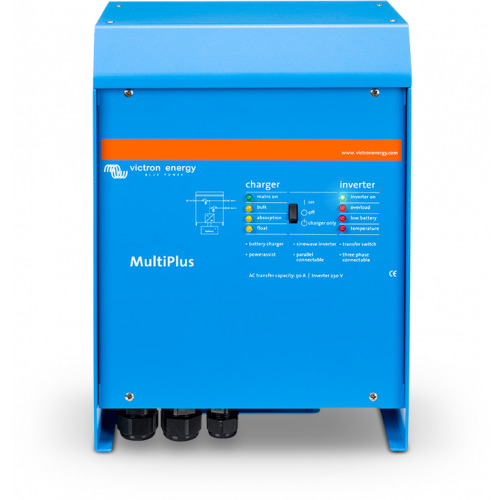 But that’s not all: up to 6 sets of three units can be parallel connected to provide 81 kW / 90 kVA inverter power and 1260 A charging capacity. 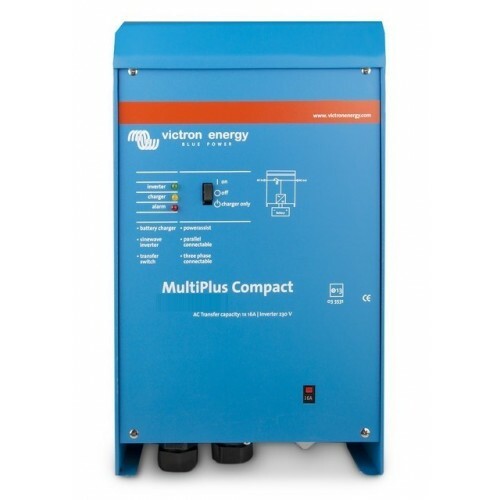 Split phase options Two units can be stacked to provide 120-0-120 V, and additional units can be paralleled up to a total of 6 units per phase, to supply up to 30 kW / 36 kVA of split phase power. 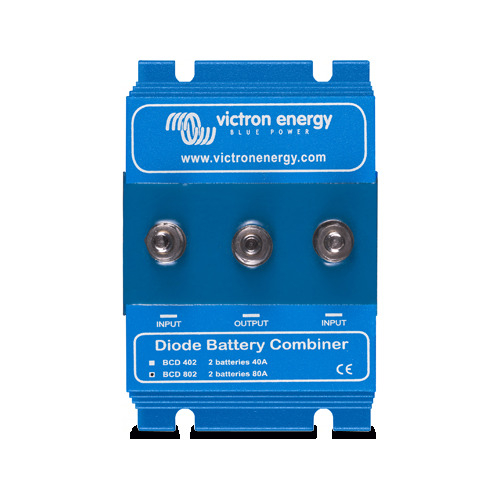 Alternatively, a split phase AC source can be obtained by connecting our autotransformer. 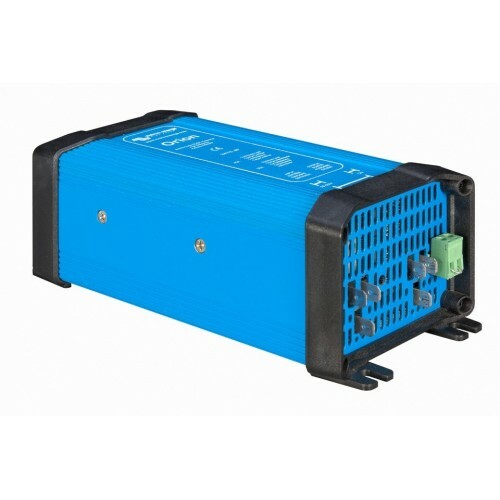 PowerControl – Dealing with limited generator, shore-side or grid power The Quattro is a very powerful battery charger. 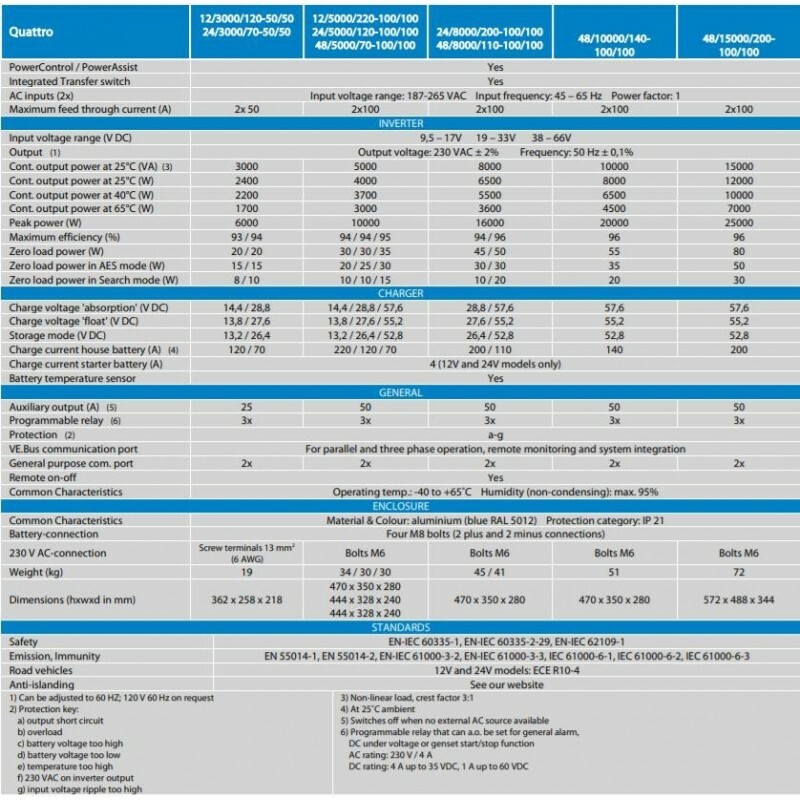 It will therefore draw a lot of current from the generator or shore side supply (Up to 40 A per 5 kVA Quattro at 120 VAC). A current limit can be set on each AC input. 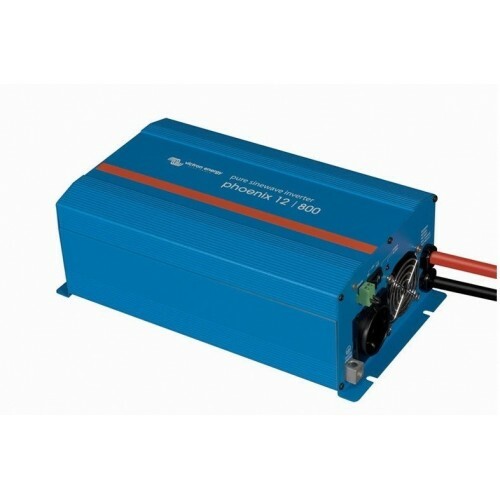 The Quattro will then take account of other AC loads and use whatever is spare for charging, thus preventing the generator or shore supply from being overloaded. PowerAssist – Boosting shore or generator power This feature takes the principle of PowerControl to a further dimension allowing the Quattro to supplement the capacity of the alternative source. 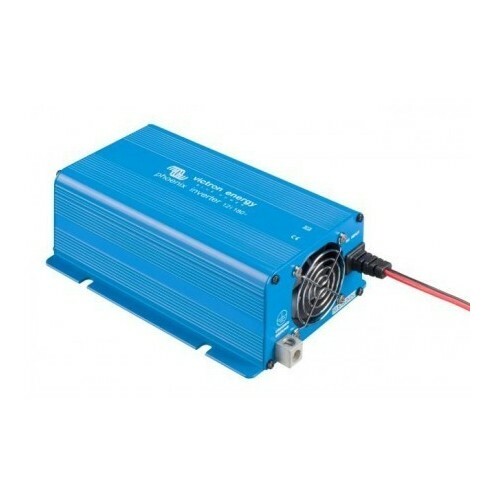 Where peak power is so often required only for a limited period, the Quattro will make sure that insufficient shore or generator power is immediately compensated for by power from the battery. When the load reduces, the spare power is used to recharge the battery. 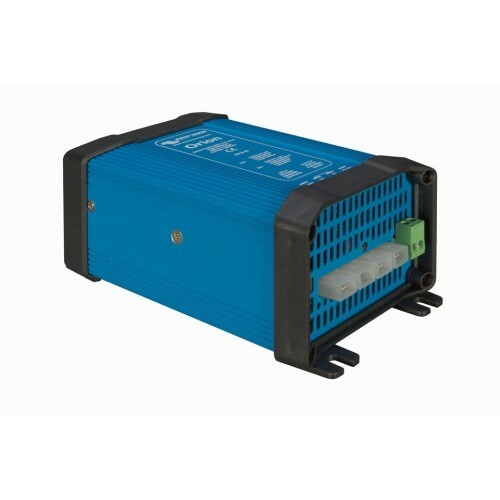 Solar energy: AC power available even during a grid failure The Quattro can be used in off grid as well as grid connected PV and other alternative energy systems. System configuring - In case of a stand-alone application, if settings have to be changed, this can be done in a matter of minutes with a DIP switch setting procedure. 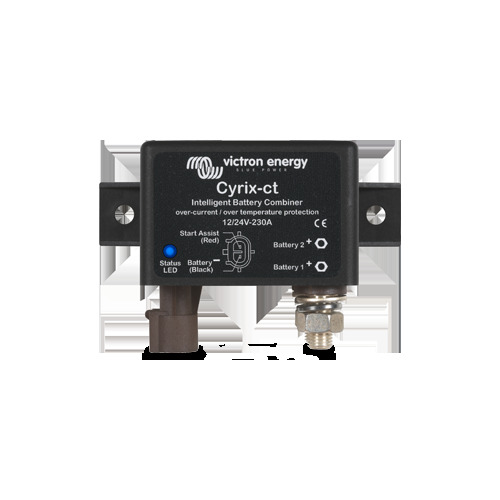 - Parallel and three phase applications can be configured with VE.Bus Quick Configure and VE.Bus System Configurator software. 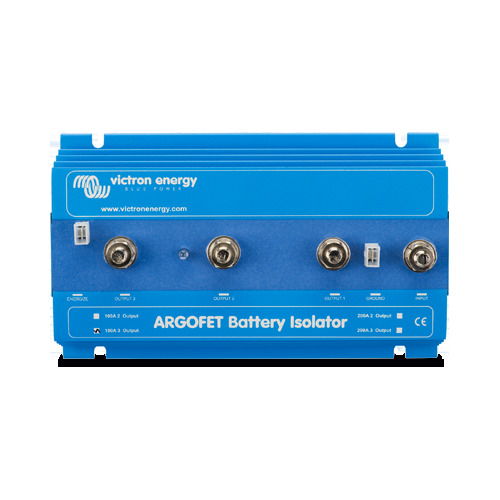 - Off grid, grid interactive and self-consumption applications, involving grid-tie inverters and/or MPPT Solar Chargers can be configured with Assistants (dedicated software for specific applications). On-site Monitoring and control Several options are available: Battery Monitor, Multi Control Panel, Ve.Net Blue Power panel, Color Control panel, smartphone or tablet (Bluetooth Smart), laptop or computer (USB or RS232). 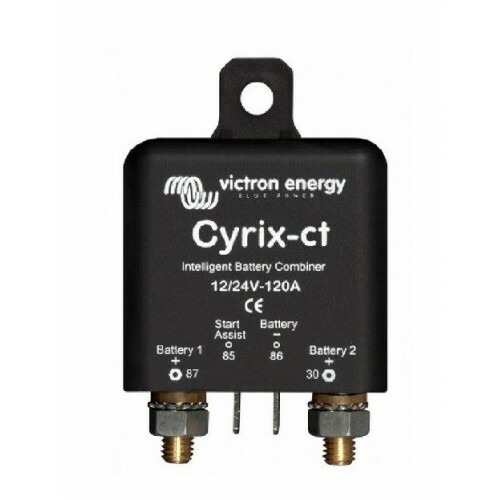 Remote Monitoring and control Victron Ethernet Remote, Victron Global Remote and the Color Control Panel. 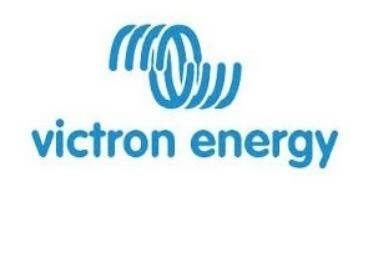 Data can be stored and displayed on our VRM (Victron Remote Management) website, free of charge. Remote configuring. When connected to the Ethernet, systems with a Color Control panel can be accessed and settings can be changed.